Sea cucumbers, sometimes called "pickles", belong to a group of animals that include the starfish, sand dollars and sea urchins. The meat, which includes the body wall and longitudinal muscles, is highly prized in the markets of the far east. Worldwide, sea cucumbers have been harvested for many years, particularly in the tropical western Pacific and Indian Oceans. 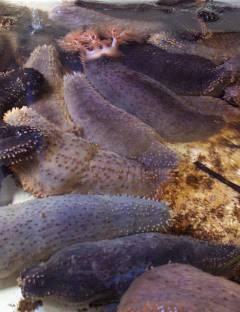 Sea cucumbers are also a source of chondroitin sulfate, used to treat arthritis and other ailments. A fishery in Maine began in earnest in 1994 with the sudden development of foreign markets. It is still small relative to other more established fisheries. About 0.5 million pounds were landed during 2014, the last year for which data are available, with a landed value of about $162,000. It is currently a very limited, closed-access drag fishery with 8 boats licensed in 2016.